As of now, I've escaped the surge of J-horror and the assorted remakes the USA is producing with an alarming rate... until now, that is. For today, I shall watch my second J-horror flick. Or should this still be considered to be my first one? 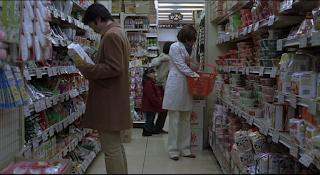 The first product of Japanese terror I ever watched was Takashi Miike's Imprint. So... let's just call this my first full-length J-horror flick. The movie informs us that, when someone dies in the grip of powerful emotions, a curse is born that will haunt the place where it has been created. Given that Bill Pullman (playing college-teacher Peter Kirk) commits suicide within the first seconds of the movie, I can't shake the feeling that he has something to do with this mysterious curse... and damn, I am right. Speaking of Bill Pullman: I can't remember when I last saw the man in a decent movie. He seems to have fallen on hard times these days. But suffice it to say that he actually has a role beyond that of moodily throwing himself off a balcony in The Grudge. He's actually important, although the reason why he is important (and why he throws himself off his very own balcony) is revealed much later in the movie. I can't blame Takashi Shimizu (who wrote and directed this movie, and is also the guy behind the Japanese Ju-On) for the late reveal, though - any movie that features Bill Pullman as the romantic love-interest would have to try and hide this fact as long as possible from the audience. I mean, I do not dislike the guy and don't think that he is... weird or something, but... romantic love interest? That's quite a stretch. 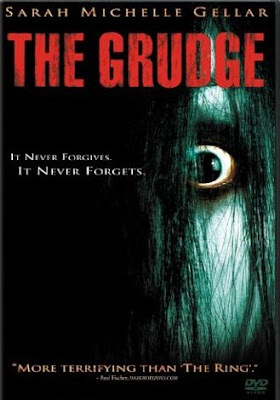 So... Sam Raimi presents: The Grudge. With Buffy (Sarah Michelle Gellar). Which sort of pisses me off - her presence means that she's not the one who suffers terribly and then goes insane and dies (because that's what I want to happen to her). She's death proof by virtue of being the female lead. Yikes. Buffy and her boy toy Doug (played by Jason Behr) have moved to Japan (from the US of A), apparently because they're studying (though it's hard to picture Buffy in a lecture - nigh impossible, even). And for some reason, I don't believe her when she's going all philosophical about Buddhist rituals - not that I doubt that what she says is true, but it just seems that she's a bit retarded and reads the facts off some sheet of paper. And I don't buy her being able to read Japanese either. Dear Mr. Raimi or whoever else thought it would be a good idea to cast Buffy as the lead: Don't. Just... don't. 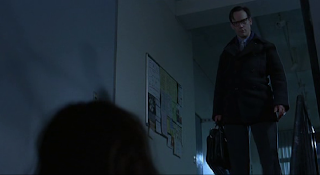 But this movie has Ted Raimi as well, which maketh me happy. One appearance by Ted Raimi can make me forgive all the major flaws of a movie. I know, I know... this is just a movie... However, seeing Buffy doing chores makes me feel as if my soul is being lifted up by invisible choirs of angels. Because I hate doing chores, and just had to do some of them and will probably do the rest of them after this review/after I finished eating this pizza (spinach and cheese topping), of which Rincewind has taken a healthy bite already (which translates to "I gave him a slice of pizza in order to befriend him"...). And so, we hop back in time, just in order to arrive at this dark place as it was in the past - just in time to see Matthew Williams (William Mapother) and his family (Emma appears to be his mother) as they buy the accursed house - and Emma feels that something is wrong... but greed and assorted emotions do not just exist in The West(TM) - also the Japanese are affected by it, and so they buy a haunted house. Gosh darn, that's what I call bad luck. What The Grudge manages to do is showing us how lost someone can feel in a strange, new land, without knowing the language OR being able to read the script. I've been lost in France without the ability to speak or understand the language, but at least English is something even the French should admit to know, and the script is still our Latin script. But losing both, script and language... I imagine that would be tough. Hell, it would make me nervous. Creepy kid. But not creepy enough - I keep thinking about its hair rather than how threatening it appears. But maybe that's just me... although, strictly speaking, children should be the ideal monster for me - other people are traumatised to death by clowns, bacteria, viruses, disease, snow (I just mention that because it's snowing outside), ponies, death... with my inherent dislike for small human critters (aka "children"), the movie-world could scare me into submission, theoretically speaking. But it never does, no matter how creepy the creepy small human critters are. Oh dear. Buffy feels that there is "something" in the house she was found in. Oh dear. Oh dear. My mind automatically made that into "MY BUFFYSENSE IS TINGLING!"... great. Now I can't take the movie seriously anymore. Curse you, sarcasm-muscle! 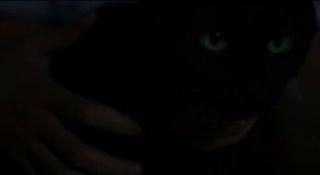 One thing that I simply have to mention is that I totally approve of the use of teh intarwebz in The Grudge. All too often in movies, you see some nameless search machine showing up on a computer, or some sort of eye-cancer inducing website that seems to have escaped from the early to mid-nineties, complete with animated .gifs and colours that just make you want to die (the alternative would be to slowly torture the person to death who actually came up with such a desaster in the first place). Here, we get so see the familiar face of yahoo and the (to me) less familiar face of some Japanese newspaper, the Daily News Japan (which is, of course, fictional but really conveys a feeling of "it's good, this site can exist"... Font-recognition can be something comforting). The concept is interesting: When dying in extreme rage and/or sorrow, at death, that part of the mind is imprinted in the area the death happened. Death becomes part of that place, and kills whoever it touches. Sort of like an infection - you can run, but you can't hide. The curse will get you, no matter where you are. I am not familiar enough with Japanese mythology, fairytales, sagas and assorted things. It's occasions like these that make me want to learn a bit more about Japanese culture and mythology - whilst the concept is interesting, I wonder how differently it impacts Western audiences than it would with a, say, Japanese audience. 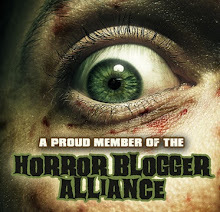 I know from my own experience that horror movies based on figures or stories that I am familiar with have a much deeper impact on me than a movie which deals with something I have no single iota of knowledge of. Anyways... the camera is, as could be expected, very good. It's not perfect, it's not flawless, it's not too original... but it's solid, and a few shots managed to really impress me. Most of them were the claustrophobic ones I have come to like in Raimi's work. As I haven't watched the original Japanese Ju-On yet, I can't say how much he, in his role as co-producer, has influenced this aspect of the movie, as I don't know Takashi Shimizu's style... but no matter who it is that is responsible for them - I still like them. Award 3 points for unnecessarily long and complicated relative sentence serving absolutely no purpose other than making this review longer. 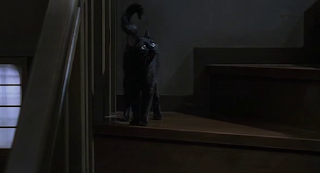 The sound of kittehs routinely used in The Grudge makes me happy - I love the critters far too much to be able to feel anything but love and loyalty to the race of my feline masters**. Something that didn't exactly help with my enjoyment of this movie was the American cast. I think my feelings on Buffy are already clear enough - but in case my dislike has been too subtle, I shall make it abundantly clear: I don't like Sarah Michelle Gellar, for she is stupid and her acting is about the quality of a dead slug. She is routinely outplayed by everyone in everything I've ever seen her in - and that includes the more obnoxious characters in the Buffyverse. Besides for Ted Raimi, whom I adore because he's so full of win and awesome, the whole rest of the American cast appears wooden and artificial. I enjoyed the scenes in which there were only Japanese actors around - by comparison, they are much better and ....livelier than the ones in which we are nearly drowned in a puddle of American-ness. I don't know why this movie was re-done for Western audiences - unless you count using wooden actors and cutting down on the plot. 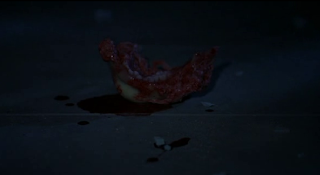 5/10 awesome scenes with a dislocated lower jaw. * This is proof that the ability of cats to drastically lessen human intelligence through mere close proximity also works through the medium of film. xkcd speaks truth. ** Only people who are owned by one or more cats will understand this.